Inspired by the high-tech, 3D-adventure film, we have added a cool new feature to “TRON: Legacy” Disney Gift Cards. All TRON cards sold at Disney Parks will include a “QR” code on the back. A “QR” or “quick response” code is a two-dimensional bar code that can be read by taking a picture of it on your mobile device. You need to have the software, but QR Readers are usually free and available for download right to your handset. It’s worth downloading because more and more companies are using QR code technology to deliver interesting content to you via your mobile phone. Once read, this code will cleverly take you directly to the official “TRON: Legacy” website where you can learn all about the movie which hits U.S. theaters December 17, 2010, in Disney Digital 3D™ and IMAX® 3D. 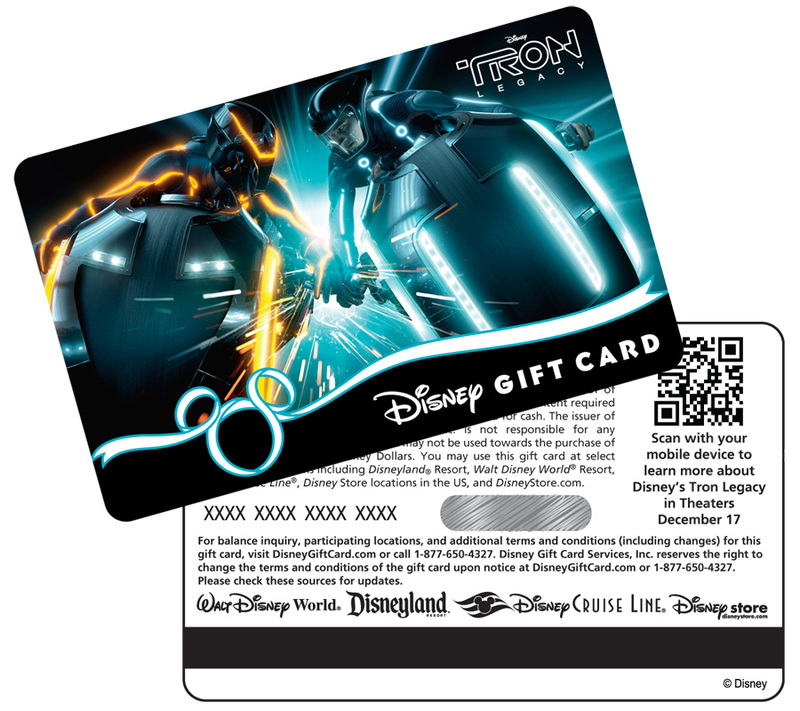 The “TRON: Legacy” Disney Gift Card will be available for purchase at Disney Parks starting today! Bring the hero to life with the Ultimate Sam Flynn Figure, featuring incredible Impulse Projection Technology that reveals a lit-up life-like image of Sam's face, light-up body, movie quotes in Sam's voice, and tons of weapons! Capturing the TRON essences these detailed replica vehicles come to life. Put your TRON action figure inside the Light Cycle and watch the character and vehicle light up. Each comes with an action figure. A true Tron icon, the Deluxe Light Cycle becomes part of the rider when it is activated by the action figure. With launching projectiles, tri-color light changes, pop-up air brakes (pop-up blasters on the Light Runner), and gravity tilt sounds you'll feel like you're part of the movie action. Ride as Sam Flynn or TRON's ruler Clu, as you race your Light Cycles with 6-foot light-emitting trails. With the legendary Air Hogs technology, you can drive the Light Cycles on wall and even upside down. For the best in audio -- and in gaming -- the Disney/Monster TRON headphones feature noise-cancellation, high quality Dolby audio and ControlTalk™ for hands-free voice calling with iPhones and other media phones. The headphones include a DSP for connection to gaming consoles for an immersive TRON gaming experience. Inspired by the TRON data disk, the iPod/iPhone audio dock provides stunning lighting effects and high quality audio. An ergonomic, 5600dpi high resolution gaming mouse inspired by the aesthetic of the TRON universe including highly detailed finishes and essential TRON lighting effects. The configurable keyboard allows you to position the number pad to the right or left to optimize your gaming set-up. Laser etched keys glow, bringing to life the aesthetic of TRON in a highly detailed gaming keyboard, inspired by the world of TRON.